Stuart ‘Psycho’ Pearce was a popular hard tackling, powerful left-back whose England debut, in a friendly against Brazil at Wembley, was the 999th England cap ever awarded. For him it was the first of 78 caps to be won over a 12-year period. Pearce’s club playing career lasted for nearly 20 years which is all the more impressive because he didn’t actually start as a serious professional until he was 21, when Bobby Gould spotted him and took him on at Coventry City. A couple of years later, in 1985, Brian Clough brought him to Nottingham Forest where he stayed for 12 years. In a match against Brazil, he played in the place occupied for the last nine years by Kenny Sansom. 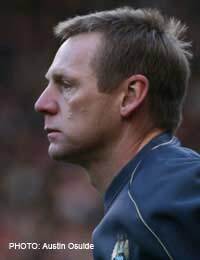 Injury prevented Pearce from taking part in the 1988 European Championships but once he returned, he ousted Sansom as the first choice left back. Pearce was a different player to Sansom, more aggressive, but in a controlled manner, possibly stronger in the tackle, but less able, at least initially, as a crosser of the ball. However, the one weapon in his arsenal that Sansom didn’t possess was a ferocious and accurate left boot which delivered numerous pile-driving free kicks and penalties for Forest and five goals for England. Unfortunately, as with goalkeepers, it’s the defender's lot to be remembered more for mistakes than for faultless defensive displays, and two incidents remain in many supporters’ minds. The first was the penalty miss against Germany in the 1990 World Cup semi-final, unusual for someone normally so adept at burying them. It’s an unfair criticism as it was Pearce’s long, accurate free kick over the Belgian defence into the six-yard box that had taken England into that semi-final in the first place. Pearce had greatly improved his passing, particular at long range, and Bobby Robson’s sweeper system enabled him to play very effectively as a marauding left back. David Platt swivelled onto his free kick in the dying minutes of extra time to volley home one of England’s best goals, breaking the 0-0 deadlock. Pearce’s second memorable gaff was an under-hit back pass in the opening seconds of a World Cup qualifier against San Marino in 1993 that led to the footballing minnows first ever international goal. This entered the record books for England as well, at under nine seconds being the fastest ever goal in an England international. However, although England went on to score seven, they had already failed to qualify for the 94 World Cup and the next tournament that Pearce would have a hand in would be the European Championships in 1996. Euro 96 was the first major tournament to be held in England since the 1966 World Cup and expectations were high, with the nucleus of the Italia 90 team still together. After the traditionally heart-attack inducing opening to the group stage, a draw against Switzerland, the team melded to dispatch Scotland, and, memorably, Holland 4-1 to lead to a quarter-final with Spain, which was level after extra-time, so penalties loomed. This was Pearce’s chance to bury the ghost of Italia 90 and not only did he do that with aplomb, but the picture of his roaring celebration, with every sinew of his body straining, has passed into English football history as the epitome of British spirit. This epitomised the spirit that had earned him the nickname ‘Psycho’, which had stuck although it wasn’t strictly accurate. Sadly the semi-final that followed also went to penalties, against Germany again, and although Pearce buried his one, it was Gareth Southgate’s turn to take the long walk after his was saved. Pearce announced his retirement from international football after Euro 96 but was brought back into the team by Glenn Hoddle, and then again by Kevin Keegan, until a broken leg ended it at 78 caps. He holds the record as Nottingham Forest’s most capped outfield player. He carried on playing and combined it with coaching and managerial jobs until the 2001-02 season when he finally stopped and became the full-time manager of Manchester City, after Kevin Keegan left. He remains a down-to-earth character, pouring scorn on tabloid calls for him to succeed Sven as England manager after only a few months in the City role. He knew that he didn’t yet have the experience and realised that it was only because he’d had a recent run of good results. However, with his appointment as the Under-21s coach, it could be that the England manager’s job will be his one day.